Spider-Man #37 (Aug 1993, Marvel) CGC 9.6 Venom Carnage Shriek and others app. 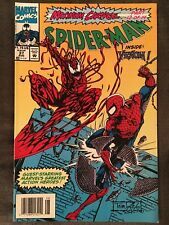 Spider-Man #37 Maximum Carnage Part 12 (Aug 1993, Marvel) NM CARNAGE Hot! 1 product rating - Spider-Man #37 Maximum Carnage Part 12 (Aug 1993, Marvel) NM CARNAGE Hot! This page was last updated: 22-Apr 08:26. Number of bids and bid amounts may be slightly out of date. See each listing for international shipping options and costs.